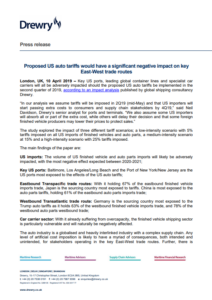 Drewry published a report according to which the new American tariffs on cars and car parts could have a negative impact on some of the largest US ports. President Donald Trump threatened to impose tariffs on 25% of the cars imported. Drewry supports that in the possibility that President Trump implements the tariffs, American auto imports from overseas markets could fall by nearly 15% by 2021. American containerized auto parts imports could fall by 10% over the same period. Specifically, in light of the possible tariffs to be imposed, President Trump is reviewing a Commerce Department study of whether these imports have an effect on national security. The study, Section 232 investigation, after the corresponding section of the Trade Expansion Act of 1962 - was completed in mid-February, and the president has up to 90 days to act on it. It has not been released, but is widely believed to conclude that foreign auto imports are harmful to American national security, thereby justifying a tariff action. The impacts on the President's decision will be obvious to many American seaports that handle an outsize share of automotive cargo. Baltimore, the Port of NY&NJ, and the twin ports of LA/Long Beach would be the most affected. Baltimore handles 12% of America's foreign-car imports, and PNYNJ and LA/Long Beach handle another 10-11% each. In addition, LA/Long Beach handles about 40% of all U.S. containerized auto parts imports, and PNYNJ receives about 10%. Overseas, those to be lightly affected in ro-ro volumes are Japan and Germany, whereas Chinese ports will experience a decrease in parts shipments. According to Drewry, American automakers are opposed to the tariffs, as the cost of American-made cars would go up, and the volume of American-made cars sold would go down. The Center for Automotive Research estimates that 25 percent tariffs on cars and parts would lead to an 8% reduction in sales and the loss of about 370,000 jobs in the auto sector. Every single U.S.-made car and truck has imported components and assembly. Tariffs of the magnitude made possible by Section 232 tariffs on autos and auto parts will increase the cost of a vehicle by thousands of dollars.